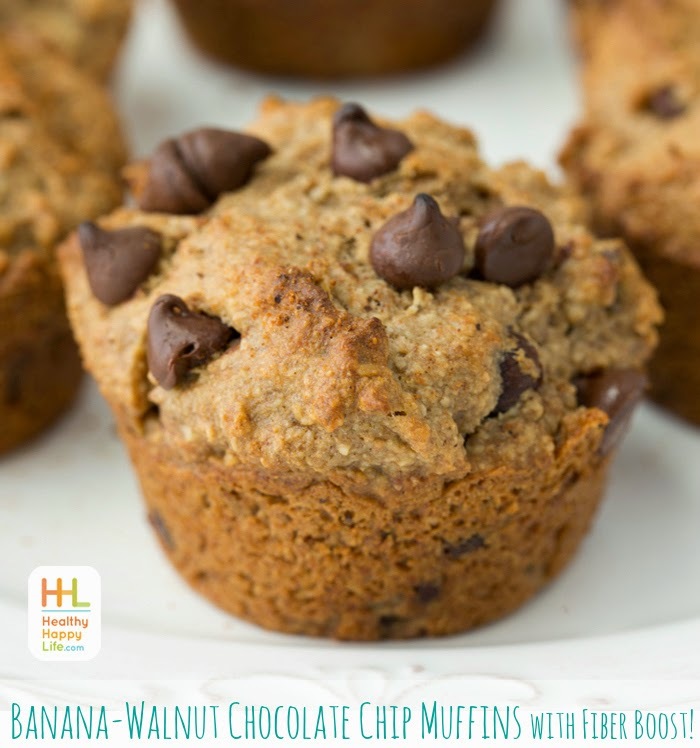 Vegan Banana-Walnut Chocolate Chip Muffins with Fiber Boost! 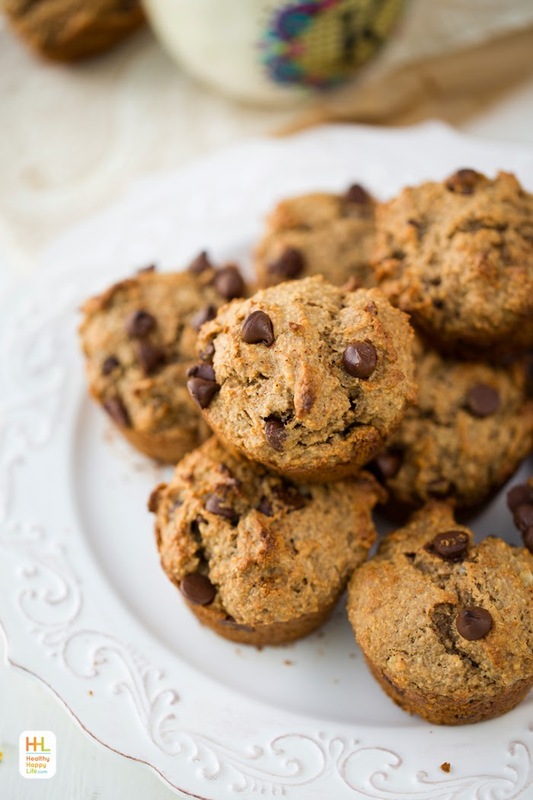 Bake up a batch of these fluffy-amazing Banana-Walnut Chocolate Chip Muffins with a bran fiber boost and nibble on them all week long! 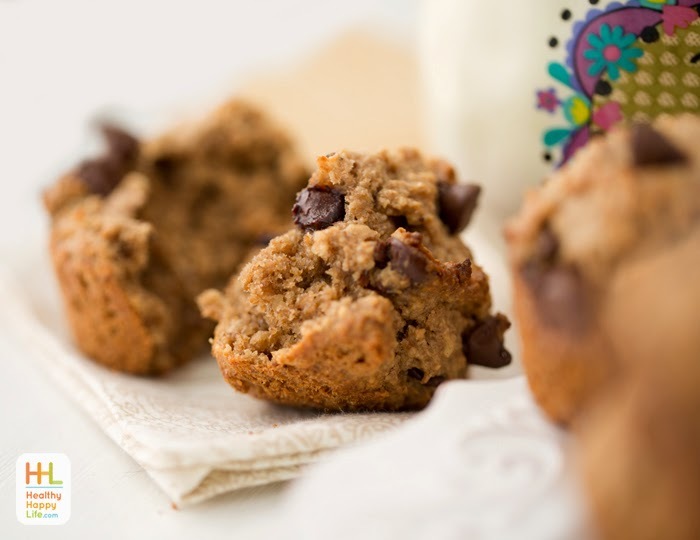 Loads of bananas, oats and dark chocolate chips to keep you coming back for more. I used my special walnut flour trick in place of adding whole walnuts because it adds so much body and great texture to the muffins. 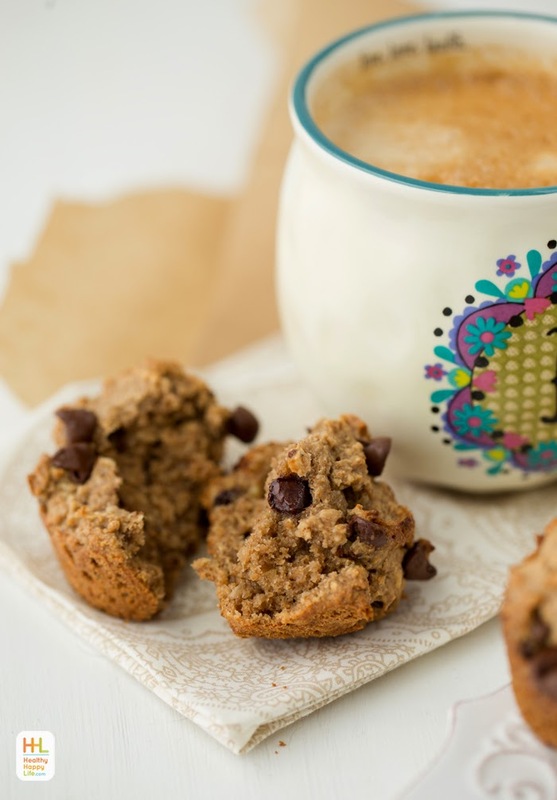 In this season of lattes, hot tea and warm 'n cozy everything, these muffins are a welcome addition to your busy day. Freeze or fridge and simply re-warm to serve. Also delicious chilled! Grab my vegan recipe.. So this is a baking recipe that (gasp) has no pumpkin in it. 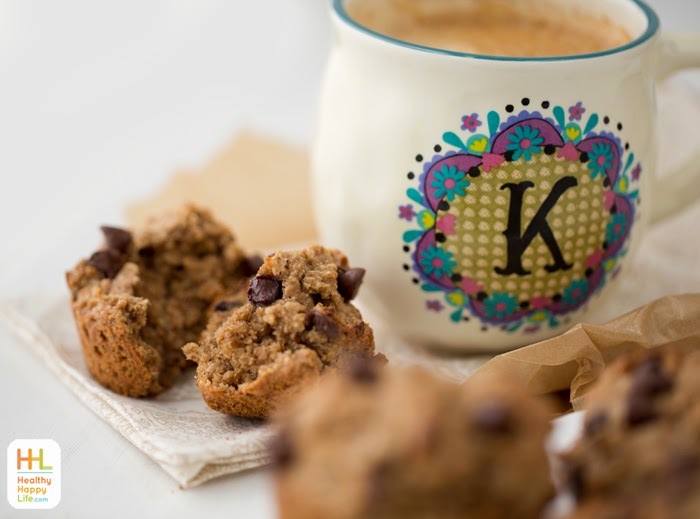 Crazy I know, for fall, but these muffins were so amazing I simply had to share the recipe. 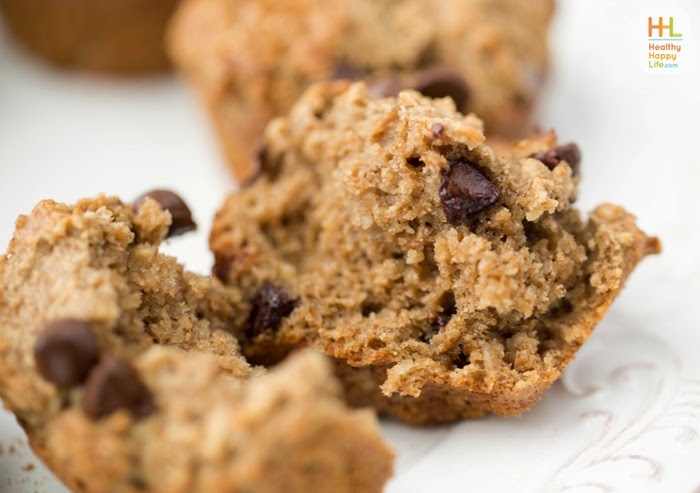 These muffins are easy to make, contain a healthy boost of fiber, are low gluten and delish! PSL Latte or ginger tea-pairing perfection. Walnut Flour! Instead of using whole walnuts, I used walnut flour. I processed the whole raw walnuts into a dense flour in my Vitamix. A food processor can also be used. Then I added the walnut flour as part of the batter mixture. Intense walnut flavor with some amazing muffin texture. Plus, since the walnut flour contains a good amount of fat, I didn't need to add much oil to make the muffins moist. Fiber Boost! I boosted the texture and fiber content by adding in some super bran. The bran I used was a trio mixture or corn, oat and wheat bran. Though you can use whatever bran you'd like. 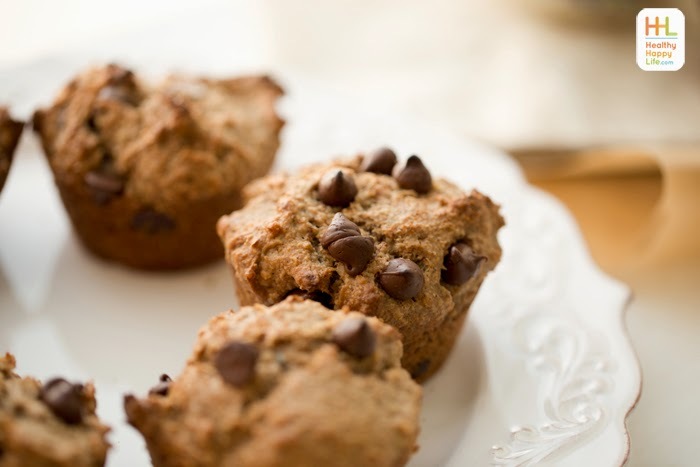 If you choose not to add the bran your muffins might not be as dense and fluffy. 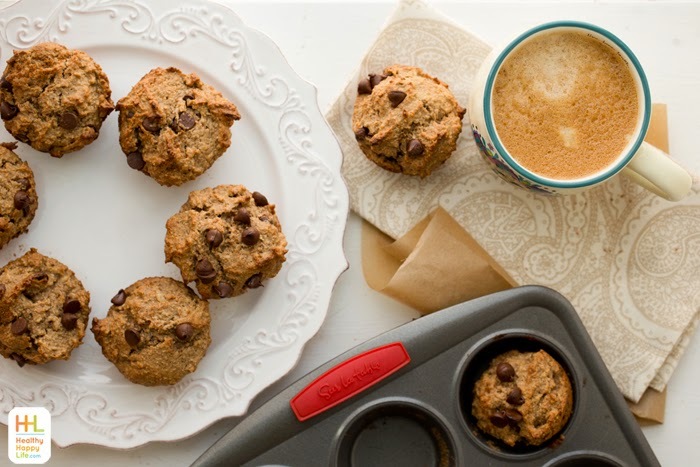 But, yes, you could simply sub with more oat flour. The addition of bran makes them so fluffy as they puff up in the oven, popping up in their muffin tins in perfect muffin top unison. If you do not have walnuts, you can substitute with whole raw almonds, cashews or even pumpkin seeds. 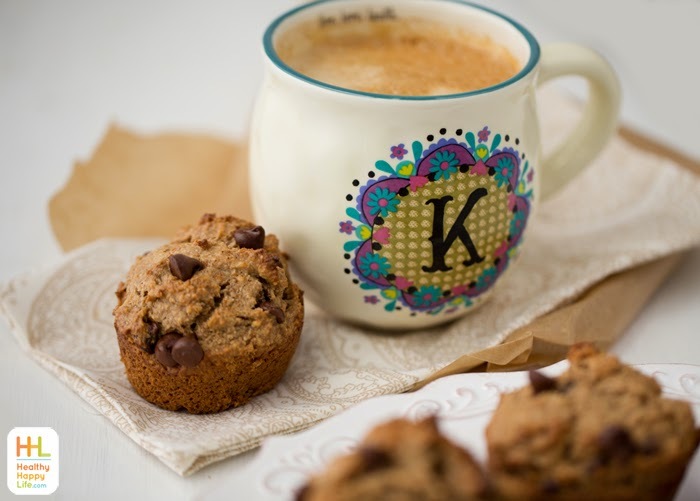 Though I adore the rustic walnut flour the best for this banana bread muffin recipe. Each muffin contains around 240 calories, 6g protein and 5g fiber. Change it up! 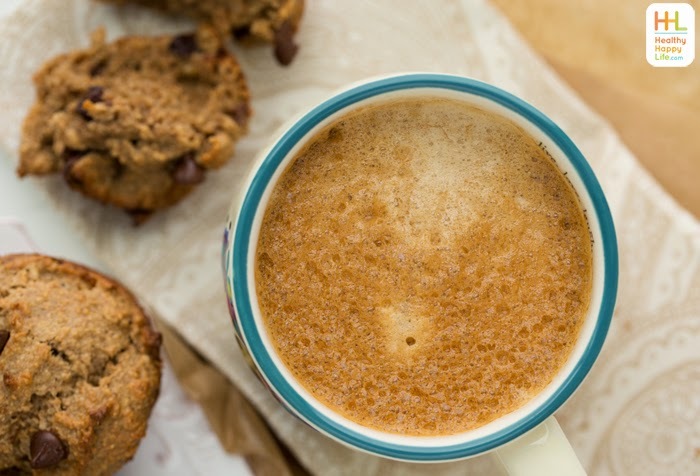 You could easily substitute fresh fruit like apples, berries or even dried fruit like raisins for the chocolate chips if you prefer something a bit less decadent. Fall apples would be amazing! Or cranberries. Or even some chopped tangerines. Yum. Or, keep the chocolate chips and ADD in some tangerines. Chocolate-orange is an amazing duo. UPDATE! (pictured above) haha, I JUST posted this, but as my second test batch was cooling, I posted and then just now took a nibble from this batch which was AMAZING. I subbed cashews for the walnuts and blackberries (frozen) for the chocolate chips. Perfect for breakfast! 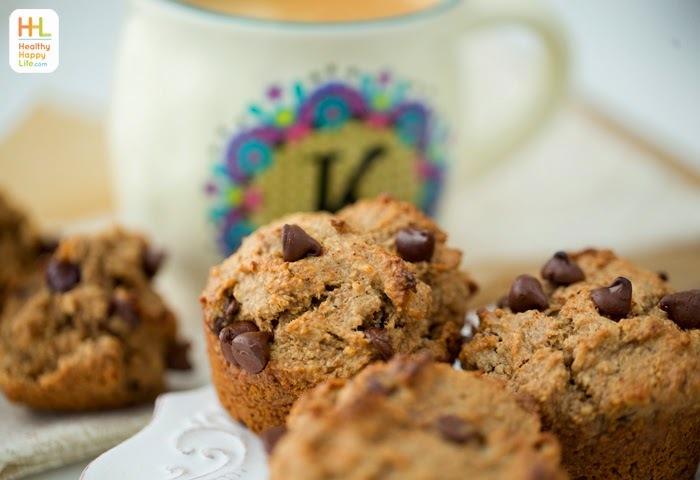 So amazing.. Love the nut flour idea I had - it really makes these muffins special! So must try-it: Cashew-Blackberry Subs. If you tried a substitute ingredient or the original recipe, let us know in the comments! Speaking of comments, I am LOVING reading your #OwnTheDay comments on my Nii Bars giveaway post! So many inspiring ideas. 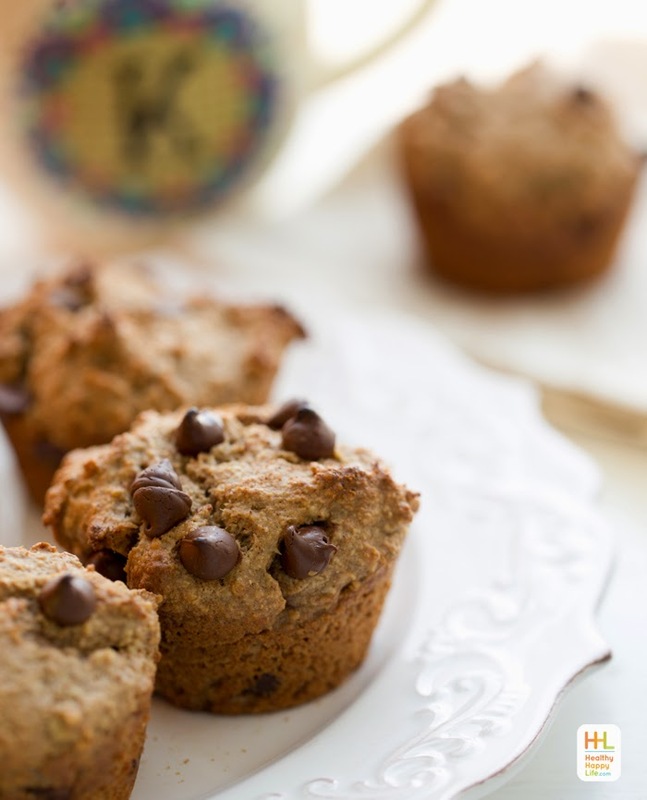 Banana walnut muffins with a boost of bran fiber. Vegan and low gluten. In a high-speed blender, process to oats and walnuts into flour. Be careful to not blend too long where the walnuts turn into a too sticky walnut butter. Pour this mixture into a large bowl and add in the salt, baking powder, cinnamon, whole oats and bran. Stir to combine. Add to the blender all the wet ingredients, bananas, oil, vinegar, maple syrup. Blend until smooth. Fold the wet into the dry and stir until a thick yet moist batter forms. Allow the batter to sit for at least three minutes before loading the muffin tins. This allows the bran and oats to soften a bit as they absorb the liquid. This also thickens the batter so things stay fluffier when baking. Bake for 10 minutes at 400 degrees, then reduce heat to 350 and bake an additional 8-10 minutes, or until edges of muffin top begin to brown. Remove muffin tin from oven and allow the muffins to cool for 10 minutes before removing from tin. Serve warm. Store in the fridge or freezer. Leftover muffins can be served warmed or chilled. Re-heat in a 400 degree oven for ten minutes or for 15-30 seconds in the microwave.